This year marked my 5th AGIG Camp and what a pleasure has it been involved yet again. 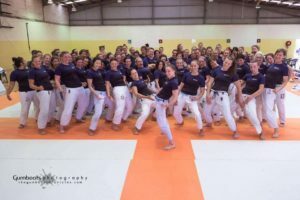 I returned as a coach, joined by Jess Fraser, Esther Tavares-Tutida, Hope Douglass and Demi Butler as well as amazing assistant coaches in Van Do, Kirsty Mather, Jessica Dobbs, Patricia VanderMeer and Robyn Jordan. 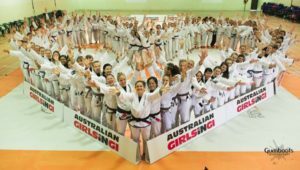 The AGIG community keeps on growing – this year there were 130 participants ranging from beginner white belts to very experienced black belts. 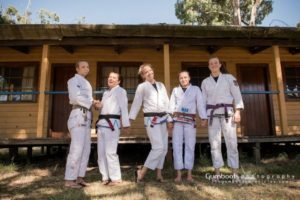 Since the theme of the camp was ‘playfulness’, I decided to teach a small part of my spider guard system. 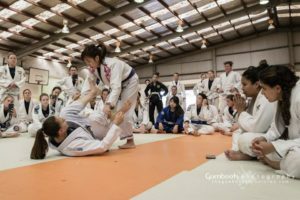 Spider guard is something I started to experiment with as a white belt, but never really used it in competition until the end of my purple belt days. It has taken me years to develop the skill and confidence to use it effectively and now it’s a big part of my game. I use it to sweep, submit, recover guard and transition to other guards. My teaching style is always quite reliant on details and technique. 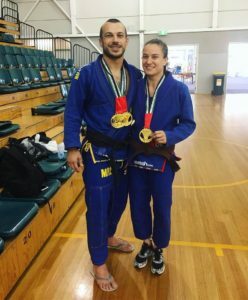 Being a small female, I can never really rely on strength to power through moves, so I pay attention to the tinniest details that make a difference between the technique working and failing. I always teach things that work for me at competitions at the highest level. The best part of my day? Photo with 130 women pelvic thrusting. Why, you ask? Because why the hell not! 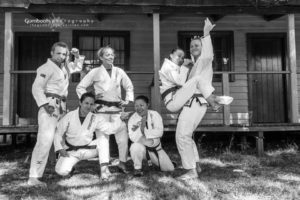 I was so thrilled to teach 13 private lessons at camp as well. 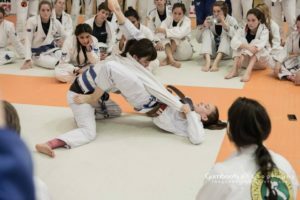 It was a pleasure to see so many ladies interested in my style and technique and most importantly thinking about the direction and progression of their own BJJ. 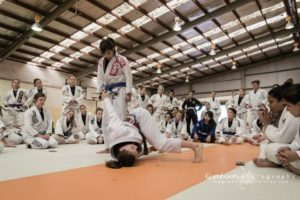 I am not a particularly fast learner, so if I can master a skill and perform it at a world class event, then anyone can. With enough smart training and repetition anything is learnable. I was so lucky to have my friend and training partner Chi with me all weekend. She was not only my ‘dummy’ for the seminar and privates, but also brought me food, coffee and lollies for the entire 4 days! I absolutely loved learning from the other coaches this year. We all have our individual touches to similar techniques and we are all successful in our own rights. It was great to see individual spins, creativity and different personalities come through. I also had many fun rolls. The lower belts picked up the techniques learnt quickly and tried to execute them during sparring. 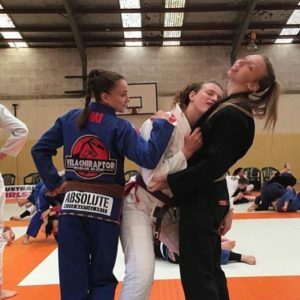 I also loved rolling with black belt Van and brown belt Jessica – I literally could not wipe the smile off my face, as it’s not often I get to have such high level, beautiful technical exchanges with people similar to my weight. The vibe this year was very positive and encouraging and I am damn proud to be a part of such wonderful community. Jess Fraser has yet again outdone herself and is an example of what can be achieved with a little bit of imagination and will-power. During the 4 week camp, I took the Saturday off to compete at the Melbourne Open Abu Dhabi Pro Trials. Unfortunately there was only one open weight ticket on offer, but it was a good hit out and a nice start to the year. In my weight division I hit a nice spider lasso sweep taught by Abmar Barbosa and a deep half pass to S mount to a cutting arm bar (which I didn’t finish). In my open weight I lost by a take down, but played a very offensive guard with a few sweep and sub attempts. Congrats to Lachie, Ben and Demi to winning their well reserved tickets to the World Pro. 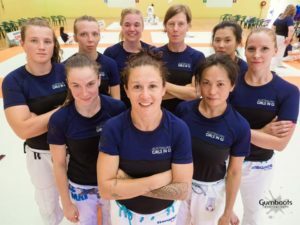 I am skipping the Sydney Open and Australian Pro Trials this year, because I will be going directly to Abu Dhabi with the help of Pony Grappling Gear. I am beyond grateful and excited for such an awesome opportunity and will be joined by some of my favourite people from around the world. Don’t forget to check out AGIG Camp photo gallery at Gumboots Photography. Hey, i am Junior-Bloggerin LIVIA 15 from Munich, Germany. You have a cool Blog and you are a strength Girl and i love your Name and Australia.